“The plot revolves around a young man, Ghyl Tarvoke, who hails from from the city of Ambroy located on the planet Halma. Halma’s ruled by unseen, mysterious Lords who run the planet as a giant welfare state. Workers are paid a stipend for their labor and all forms of mass production or duplication (including printing) are strictly, and I mean strictly, prohibited.” When Ghyl’s father, a wood-carver, is executed for processing old documents with a camera, Ghyl rebels and decides to bring down the system. A recent edition of the book can be purchased for Kindle at Amazon.com. Your purchase via our affiliate links will help support our work here at Prometheus Unbound. If you prefer, Barnes & Noble has the book as an epub. There don’t appear to be any dead-tree editions in print, but new and used copies of old editions can be found. 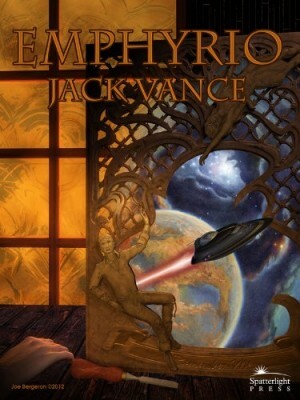 Join us as we read and discuss Emphyrio. I’ve already started a thread on Vance’s idiosyncratic prose style. Everyone enjoyed Matthew Alexander’s libertarian science fiction novel Wĭthûr Wē, both for its writing quality and for its uncompromising Austro-Libertarian content. The general consensus seems to be that Matthew did a very good job at the difficult task of incorporating the philosophical, political, and economic elements into the plot without coming across as too preachy. The novel rivals some epic fantasies in length, however, so it does take some courage to begin reading and perseverance to get through. A couple of forum participants compared Wĭthûr Wē favorably to Ayn Rand’s Atlas Shrugged. One observed that Matthew presented the other side’s arguments more fairly. Another liked that, unlike Rand, Matthew illustrated how our ideals could be realized and that the main protagonist in Wĭthûr Wē is a more fully realized human being than Rand’s concretized ideals, such as John Galt. Last month we held our first ever Lightmonthly Read Author Chat via Google+ Hangouts on Air with Matthew. For more information and the video recording of the event, check out my recap post. It was a successful launch and we look forward to doing more of these with other authors. Jeremiah Dyke reviewed Wĭthûr Wē on Prometheus Unbound a while back, so there won’t be a new review of it coming out this month. If you want a say in what we will read next month, head on over to October 2012 Nominations thread in the book selection forum and put in a nomination. Deadline for nominations is Monday, September 10th. Then voting will be open on the nominees until Thursday, September 20th, when the winner will be determined.